Aloha all! It's Friday and I'm happy the holiday weekend has come. We have plans to visit with family and take the kids out on a boat for the first time. They are very excited! I'm looking forward to a good old fashioned cook out and the fireworks display. My question for this week is: What are you looking forward to this weekend? 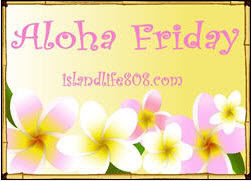 For more Aloha Friday Fun, visit An Island Life. Thanks for stopping by. I hope you have a safe and happy 4th!